1 A None No Power Seat 1 A is a standard Business Class seat that has restricted legroom. The proximity to the galley may be bothersome. 1 C None No Power Seat 1 C is a standard Business Class seat that has restricted legroom. The proximity to the galley may be bothersome. 1 D None No Power Seat 1 D is a standard Business Class seat that has restricted legroom. The proximity to the galley may be bothersome. 1 F None No Power Seat 1 F is a standard Business Class seat that has restricted legroom. The proximity to the galley may be bothersome. 24 C None No Power Seat 24 C is a standard Economy Class seat however, the proximity to the lavatories and galley may be bothersome. 24 D None No Power Seat 24 D is a standard Economy Class seat however, the proximity to the lavatories and galley may be bothersome. 25 A None No Power Seat 25 A is a standard Economy Class seat that has limited recline. The proximity to the lavatories and galley may be bothersome. 25 B None No Power Seat 25 B is a standard Economy Class seat that has limited recline. The proximity to the lavatories and galley may be bothersome. 25 C None No Power Seat 25 C is a standard Economy Class seat that has limited recline. The proximity to the lavatories and galley may be bothersome. 25 D None No Power Seat 25 D is a standard Economy Class seat that has limited recline. The proximity to the lavatories and galley may be bothersome. 25 E None No Power Seat 25 E is a standard Economy Class seat that has limited recline. The proximity to the lavatories and galley may be bothersome. 25 F None No Power Seat 25 F is a standard Economy Class seat that has limited recline. The proximity to the lavatories and galley may be bothersome. A variety of short films are played on overhead screens; located throughout the aircraft. Austrian Airlines' Airbus A319-100 operates in a two class configuratuon with 28 Business Class seats and 102 Economy Class seats. This aircraft is primarily used on short- and medium-haul flights. Business Class is made by covering the middle seats in the first few rows of the aircraft. Meaning, the configuration of this aircraft varies. The seat pitch and width remains the same, however, you are given a bit more space with the middle seat being blocked out. 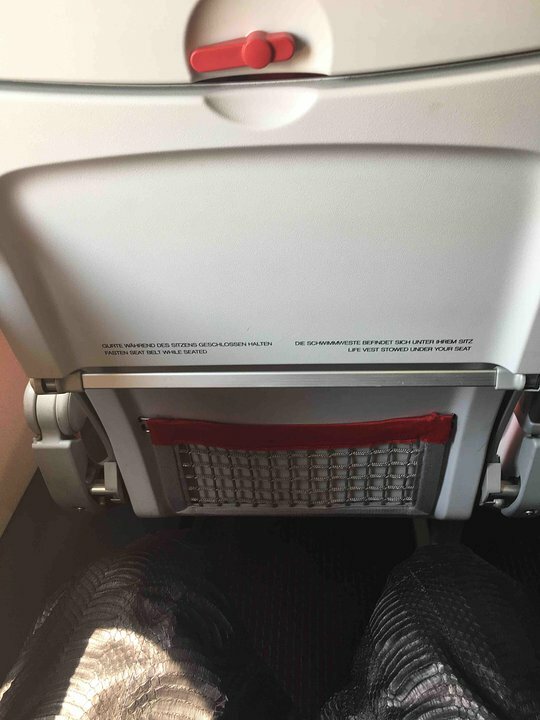 The best seat on this Austrian 319 is simply 10C or D The exit row is the ONLY row with extra legroom, it is worth the 35 dollars you have to book in advance or chance it and grab the seat at check in. Nice plane. I order warm breakfast its like 1' class food. If u can do it, so do it. its about 10. Cabin crew is nice. you will get a free drink even, if you dont have order extra. Thin seat but its okay for a 1h 45 min flight. also, dont reserve Row 4 its cramp and nearly no leg room. im 185 cm. and i fit perfectly on row 5. Pitch 30" in business is the same as in economy which is not acceptable for the business. Its not a business class seat, just a standard seats but middle seat is blocked out. Seat itself is quite hard and uncomfortable. Food is ok for business class. 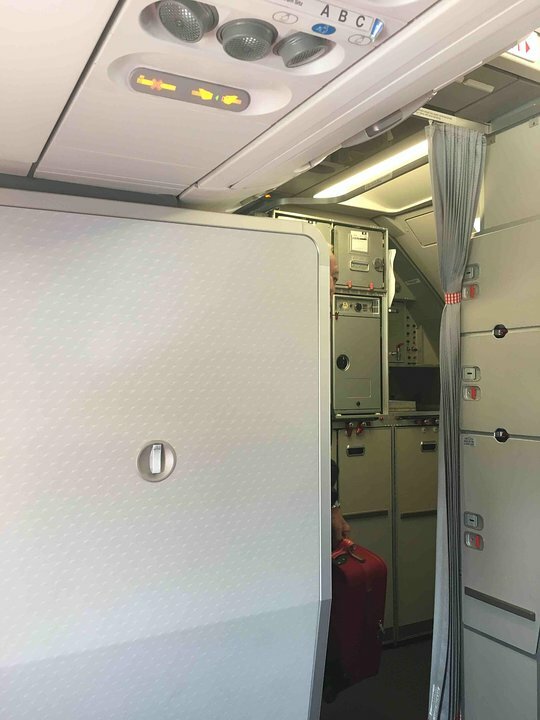 Row 7 is preferable because it has a "single-width" overhead baggage compartment, which reduces the risk of getting your baggage damaged by others. Austrian flies 1 versions of Airbus A319-100.